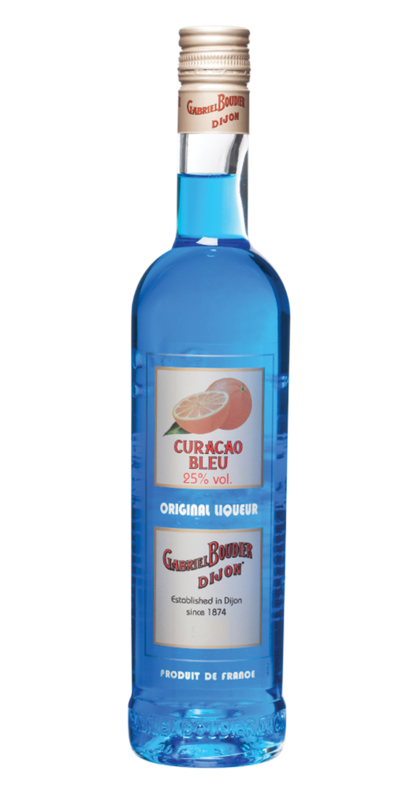 Gabriel Boudier Bartender Curacao Bleu Liqueur | Bartender Liqueurs — Emporia Brands Ltd. Knowledge and expertise of more than 140 years is at the heart of the House of Gabriel Boudier. A name that is now renowned worldwide. Since its foundation in 1874, Gabriel Boudier has invented and diversified into a range of exceptional products that delight enthusiasts of crème de fruits as well as liqueurs. Gabriel Boudier is now synonymous with authentic tastes which we invite you to discover, enjoy and share with us. The Gabriel Boudier Bartender range is par excellence for times of celebration and fun. The name denotes a trend-setter or aficionado, the Bartender range leads the way and keeps you company at sociable and relaxing occasions. Since the very beginning, Gabriel Boudier established a reputation for the distillation of citrus fruits and in particular, the Curaçao orange, which on account of its bitterness and orange notes enables them to obtain a liqueur which is the basis for numerous cocktails. The small Curaçao oranges with their highly aromatic skins and less interesting flesh are distilled without their zest in Gabriel Boudiers’ 170-year-old alambic still. They are then aged for several months in their lofts in glass demi-johns before a small dose of sugar and blue colour is added to enliven your cocktaiils. The characteristic aroma of this liquer is shown by its bitterness and delicate orange aroma.